I’ve always found it interesting how we, as humans, can form a connection with just about anything – including pets, robots, and even stuffed animals. But Baymax always felt like a fellow human rather than a robot – perhaps that’s what makes him so lovable! Regardless of why we find him so appealing, there’s no doubt that he was the true start of Big Hero Six. 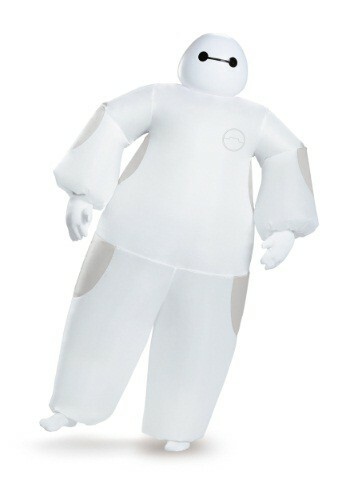 Be big, white and puffy when you go to your next Halloween party in this inflatable Baymax costume! You're sure to be the star of the party – everyone loves Baymax! When you meet new people just ask them, "On a scale of one to ten, how would you rate your pain?" They're sure to be thoroughly impressed! This licensed costume inflates so that you can be the large and in charge robot. Hook up with Hiro and the gang, and you'll be able to take on any bad guy! This costume comes with everything you need to be someone’s personal health assistant this Halloween. The inflatable jumpsuit has a back zipper for easy on and off and has elastic at the neck, wrists, and ankles to keep the air in. The jumpsuit inflates with a battery-operated fan that is at the back of the left hip. To top off the look, the included padded gloves give that same plump look as the jumpsuit and the molded plastic mask has mesh-covered eye openings so you can look just like Baymax while still being able to see your buddies.